I made these last night from a tutorial at My Mama Made It. 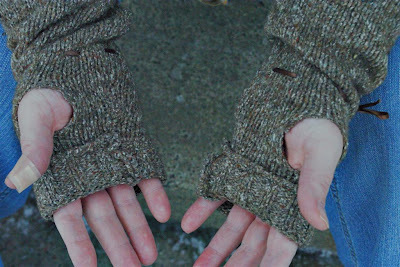 I used a sweater that I haven't worn in years but loved so much I could never get rid of it. Hubby kindly photographed them for me. I am quite taken with them fun, easy, and cute. A fun alternative to the more practical ones I've made. 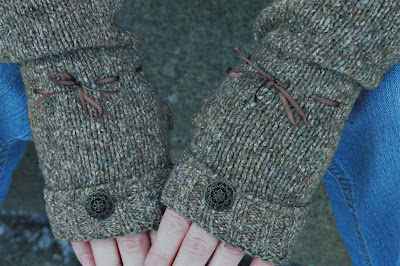 What an excellent way to get the fingerless gloves without knitting (for which I have zero time of late!). The ribbon at the wrist is a pretty adornment and seems like a very practical addition as well. Super cute, Melissa. 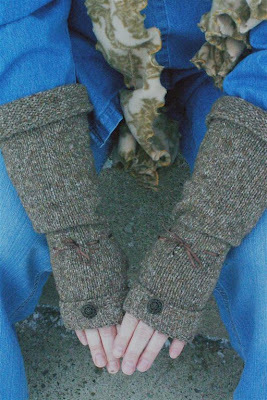 I like the idea of using an old sweater that you love but no longer wear! I am SO going to do that. The girls go through a lot of sweaters and I bet I could sew up some of those from their old ones.